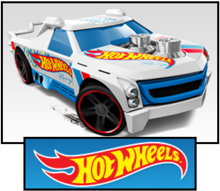 Hot Wheels® are the ever popular small cars and trucks that run on sections of plastic track. Each car or truck generally retails for around one dollar. Kids love to play with Hot Wheels® and we keep a box of cars and lengths of track on the Toy Shelf for our grand kids and other visiting kids. I’ve written an earlier Hot Wheels post (click on the following link to see Hot Wheels, September 2009). 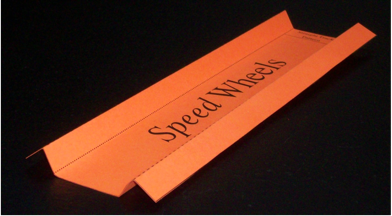 In that post I made the observation that Hot Wheels® are all about fun and the force and motion concepts of displacement, speed, velocity, acceleration, gravity, gravitational potential energy, kinetic energy, and force and I promised to explore these concepts in later posts. So here's the next post in the series. 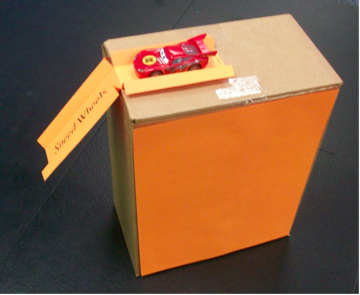 Kids can explore the above concepts using a Hot Wheels® car or truck, a few lengths of track, and a cardboard box (see Figure 1). Consider the car in Figure 1. When given a slight push, gravity powers the car, pulling it down the track. It leaves the curved section at the bottom of the track with its maximum speed. The car will continue to roll along the straight portion of the track until friction reduces its speed to zero. 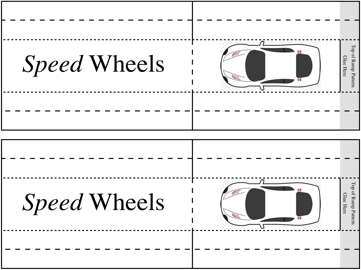 Kids soon learn, just through play, that the higher the car is placed on the track (see a, b, c, in Figure 1), the greater the speed of the car as it exits the track. And, the higher up the track, the farther the car rolls along the straight track before coming to a stop. Play provides them with what is called implicit knowledge. This form of knowledge generally differs in detail from the expert knowledge of the physicist. With the foregoing in mind, let me share just a bit of the current academic research as to how children learn science. There is a National Research Council document, Taking Science to School – Learning and Teaching Science in Grades K-8, that can be obtained free, in PDF format. Send an email request to grandadscience@gmail.com and I will email you a copy. 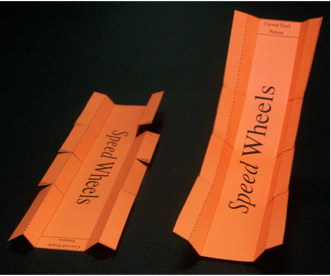 The document states four conclusions reached by the authors of the book, two of which relate directly to kids making and playing with the Speed Wheels track. • Children entering school already have substantial knowledge of the natural world, much of which is implicit. • Students learn science by actively engaging in the practices of science. 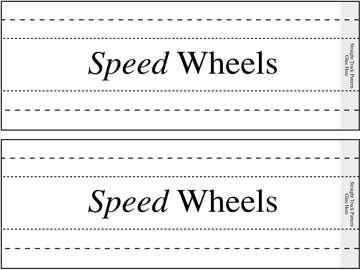 As mentioned above, kids playing with a car or truck on the track will discover on their own the relationship between at what point on the track the car or truck is placed and released and its speed at the bottom of the curved section and the distance it will travel along the straight section of track. What Taking Science to School – Learning and Teaching Science in Grades K-8 is telling us is that we should talk to kids, let them tell us what they learn from playing in a play environment like Hot Wheels® cars and track, and then build on that implicit knowledge with the goal of helping kids reach the expert knowledge level. The car or truck at the top of the ramp has gravitational potential energy (PE). PE is expressed by the formula PE = mgh where m is the mass of the car, h is the release height, and g is the acceleration due to gravity (surely an ‘expert’ piece of knowledge). As the car or truck is pulled down the ramp, PE is converted to kinetic energy (KE), the energy an object has due to its motion. The formula for KE is KE = 0.5mv2 where m is the mass of the vehicle and v is the velocity (speed) of the vehicle. As the vehicle descends, PE is converted to KE and at the bottom (see b in Figure 2) all of the PE has been converted to KE and the vehicle has reached its maximum speed. The terms PE and KE (not the formulas) and the relationship between the two can be taught to elementary school kids. This is best done by playing with them and teaching them the terms and how the terms apply to the car or truck rolling down the track. Doing so gives them the foundation to build on when they reach middle and high school and the teacher uses these terms. If you would like to build the track shown in Figures 1 and 2, follow these instructions. Over the years, as the plastic track began to degrade from use, I became frustrated by not being able to easily find and purchase the plastic Hot Wheels® track separate from the expensive themed sets sold at the major retail outlets. So, I designed patterns for both straight and curved pieces of track. The patterns are printed on card stock, scored, cut, folded, and then glued together to form a single seamless track. The patterns make it possible to duplicate the setup shown in Figure 1 with as long a straight track section as required to give the cars or trucks enough track to come to a stop. and I will email you the patterns in PDF format. Print each pattern on card stock. You can purchase card stock at almost any office supply retailer. Each pattern contains solid lines, dashed lines, and dotted lines. • Use a ruler and the opened end of a paper clip to score (trace over) every dashed and dotted line. Scoring makes it easy to fold card stock. • Cut along only the solid lines. • Use the diagram below to determine if a scored line is a valley fold or a mountain fold. • Apply white glue to the shaded area to glue together track sections. Here’s what the pattern for Speed Wheels track looks like. Note the dashed and dotted lines and the shaded glue here area. Make as many sections of straight track as needed. When correctly folded, each section of straight track should look like the one in the following picture. The following pattern is for the curved section of track. Note the small, triangular-shaped shaded areas on the pattern. Glue the triangular-shaped areas to form the curved track section as shown in the following picture. Finally, here’s the Top of the Ramp section of track. Tape or glue this section of track to a cardboard box as shown in the following picture. Insert one or more sections of straight track between the top of the ramp and the curved track so that the track matches the height of the box. The bottom of the curved track should transition smoothly to the straight track.